We live in a world where the weather in China can affect the price of wheat at harvest in the United States. A drought in Brazil can affect domestic soybean prices. A political coup halfway around the world or a change in leadership in a neighboring country can sway trade relations, affecting import/export outlooks and, therefore, prices for a host of commodities. Cattlemen from other countries have long taken an interest in the U.S. cattle industry, often sending youth and industry leaders to the United States to study U.S. production systems. We found it interesting as we started tracking viewers of our API websites that a percentage of the hits originated from international destinations — Canada, Mexico, Brazil, Argentina, Chile, Australia, the United Kingdom and others. Interest in marketing Angus genetics abroad is increasing, and global partnerships and investments are occurring more frequently. There's a lot to learn about Angus herds and events in other countries, as well as about marketing seedstock abroad. 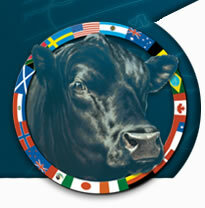 Let www.Angusinternational.info serve as your Web portal to information about the Angus societies and cattle industries around the globe. We're excited about the possibilities of this website being a platform for global information sharing within the Angus family worldwide. We invite Angus associations and societies from other countries to contribute to this site by sharing information about their Angus herds and events. Editor's Note: The articles used within this site represent a mixture of copyrights. If you would like to reprint or repost an article, you must first request permission of Angus Productions Inc. (API) by contacting the editor at 816-383-5200; 3201 Frederick Ave., Saint Joseph, MO 64506. API claims copyright to this website as presented. We welcome educational venues and cattlemen to link to this site as a service to their audience.